Bolivia is expanding the La Paz-El Alto cable car system that has already exceeded expectations for ridership and revenue. Photo by Gwen Kash. A few months ago, TheCityFix reported on the opening of the Mi Teleférico cable car system that connects the cities of La Paz and El Alto, Bolivia. The system helps residents navigate the mountainous terrain and has the potential to significantly reduce travel time between the cities, which together form one of the fastest growing urban areas in Bolivia. Mi Teleférico has already exceeded expectations. In its first two months, the Red Line transported 2.3 million passengers and collected more than 8 million Bolivianos (USD$ 1.2 million) in fares, well above what had been projected. Learn more about the launch of Mi Teleférico and see pictures of the impressive Red Line here. Mi Teleférico originally included plans for three lines: Red, Yellow, and Green, to match Bolivia’s national flag. The Yellow Line opened on Monday, September 15, 2014, and when the Green Line opens next month, Mí Teleférico will become the longest cable car system in the world. However, the expansion of the cable car system will not end there. 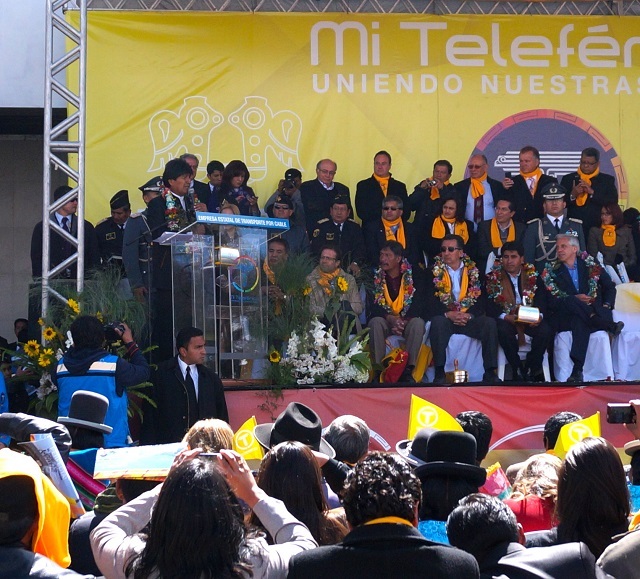 At the opening ceremony of the Yellow Line, President Evo Morales confirmed announcements that there will be a second phase of additional lines constructed next year. He told the crowd, “We can’t feel as if we’re still a small developing country. We need to have bigger optimism and investments.” He reiterated that Mi Teleférico has been financed with revenue from nationalized companies. 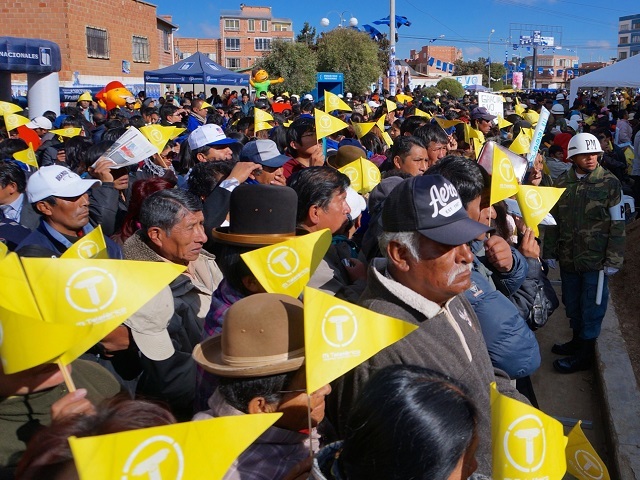 After taking the first journey on the line, President Evo Morales addresses attendees of the opening ceremony for the Yellow Line of Mí Teleférico outside the Libertador station in El Alto. Photo by Gwen Kash. After the ceremony, music continued to play and some attendees waited for an hour or more to be among the first to experience the Yellow Line’s 15-minute journey through eucalyptus groves, over city parks, and with panoramic views of La Paz’s growing skyline. With four stations and a total length of 3,883 meters, the Yellow Line is the longest of the three originally planned Mi Teleférico lines. It is also just as photogenic as its predecessor. The expanding Mi Teleférico system improves sustainable transport in the country’s most populous metropolitan area. Photo by Gwen Kash.